Photo credit: Davidlohr Bueso, CC BY 2.0. LAURA: And to you! Are you in the midst of planning for your Volume 2 publication week? NICOLE: I am, although most of the planning is done at this point. It’s just making sure all of the websites have the book set up and everyone has the capacity to buy it. LAURA: Very cool! Are you planning a post-publication treat for yourself, or is that for after the tour? NICOLE: That’s the four-day vacation I’m taking after the tour. 😀 How about you? Where are you in your “leaving Ann Arbor” plans? LAURA: I’m finally catching my breath a bit! My husband Eric and I packed and moved all of our stuff to a storage locker in the suburbs of Boston, then took off for a couple months in Southeast Asia before we move and I start school. We’re currently in Siem Reap, Cambodia. Eric is still working (he’s a freelance journalist) and I’m working remotely part-time for my old office on a summer project. NICOLE: Wait WHAT? That sounds amazing! LAURA: It’s been exciting! We figured we wouldn’t have a chance to do this for at least several years, so we’d take the opportunity. NICOLE: I’m very curious about how you found housing, visas, etc. How long does it take to plan a few months in Cambodia? LAURA: So far it’s been pretty smooth. 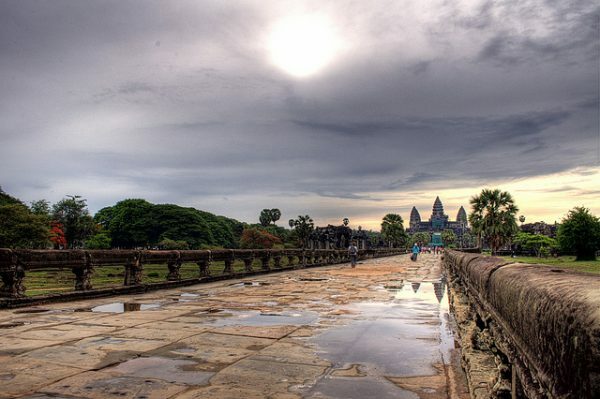 Cambodia offers tourist visas on arrival that are good for 30 days, and we’re planning some trips around the area that will have us out and back for new visas a couple of times. Thailand also offers a visa on arrival, but others are more complicated, like Vietnam. In terms of housing, we’ve been at a guest house for a week and have been looking for a short-term apartment rental. But we’re still sorting things out! I had hoped to plan a bit more, but forgot how stressful/time consuming moving is. NICOLE: Moving is THE WORST. LAURA: YES. It was not great. I’m not looking forward to moving all of our stuff out of storage in August. NICOLE: I bet you could hire someone to move it for you! But you’ll still have to unpack it all. LAURA: Yes! Hiring movers has been a game-changer for me. It’s super useful to pay someone to help load the truck for a couple hours — definitely worth the money. Did you hire movers when you moved? I think I remember you shipped most things from Seattle. NICOLE: I didn’t hire movers. Since I didn’t have a lot to move, shipping some boxes (and selling my furniture) made sense. I’ve never owned enough stuff to justify hiring movers, though I did rent a Pod for one move. That turned out to be very convenient. Also, pods pods pods! LAURA: It seems like a great option. And yes, pods! NICOLE: One more question, then (and no, it’s not “what advice do you have for Billfold readers”): how has the way you do money changed since you started living in Cambodia? LAURA: I’m much, much better at tracking my daily spending. Back home, I have a general sense of what I’m spending on, but here I’m using cash and actually writing down each purchase. I’m hoping I can keep up the habit once I’m back in Massachusetts. NICOLE: It’s a great habit, although at this point I let the apps track each purchase. But I check my apps ALL THE TIME. LAURA: I need to get better with apps! They are such useful tools. NICOLE: But yeah, I’m coming up on 14 years of tracking every penny spent. LAURA: It’s a great way to be.